Corrosive wear occurs when the component operates in a corrosive media, liquid or gas [1, 2]. In this type of wear, the tribochemical reaction between corrosive agent and the bulk material generates a reaction (protective) layer on the surface. During the sliding friction, this layer is removed and the tribochemical reaction is started again. If the growth of the layer is faster than its removal, then only this layer is worn and not the bulk material directly. However, if the growth and removal of the layer is too fast, then there is an excessive wear of a bulk material through the reaction film. Thus, the balance of the growth and removal determines the state of wear: mild or severe. When the corrosive media is air, then the oxygen acts as a corrosive agent and the wear is called oxidative. However, the oxidative wear may take place in lubricated environment as well, due to the presence of the dissolved oxygen. At the beginning, the oxidation rate is fast due to place exchange mechanism and the oxide film on the iron surface grows quickly. When the film thickness reaches approximately 2-3 nm, the oxidation rate slows down and the formation of oxide film continues by diffusion of oxygen into the metal. On the other hand, the lubricating oils may contain chemical additives to enhance the wear behavior in contact[1, 7]. These additives form a protective tribofilm, and the performance and corrosive wear rate of such additives is dictated by the rate of formation, removal and replenishment of the tribofilm. The thickness of the formed layers varies from 50 to 150 nm (ZDDP antiwear additive). In case of pure oils with no additives, oxidation caused by the dissolved oxygen develops the protective tribofilm and thus, is beneficial. However, in case of lubricants with additives, additional corrosive wear from oxidation is not necessary and, thus, additives also prevent oxidative wear. There exists an optimum on the lubricant capability of formation of protective layer, without causing the excessive corrosive wear. The boundary layers developed due to chemical reactions possess certain beneficial properties, including anisotropy in normal and shear directions (low shear and high normal strength), separate surface by the distances at which adhesion forces are weakened, etc. Stachowiak G. W, Batchelor A.,W. Engineering Tribology, Third Edition. Burlington: Elsevier; 2005. Bhushan B. Modern Tribology Handbook. Columbus: CRC Press; 2001. Wang S, Q., Wei, M., X., Wang, F. Transition of Mild Wear to Severe Wear in Oxidative Wear. 2008;32. Quinn TFJ. Review of Oxidational Wear. Part I: The Origins of Oxidational Wear. 1983;16. Hong H, S. The Role of Atmospheres and Lubricants in the Oxidational Wear of Metals 2002;35. Batchelor A, W., Stachowiak, G.,W., Cameron, A. The Relationship Between Oxide Films and the Wear of Steels. 1986;113. Onodera T, Morita, Y., Suzuki, A. A Theoretical Investigation on the Abrasive Wear Prevention Mechanism of ZDDP and ZP Tribofilms. 2008;254. Hsu S, M., Gates, R.,S. 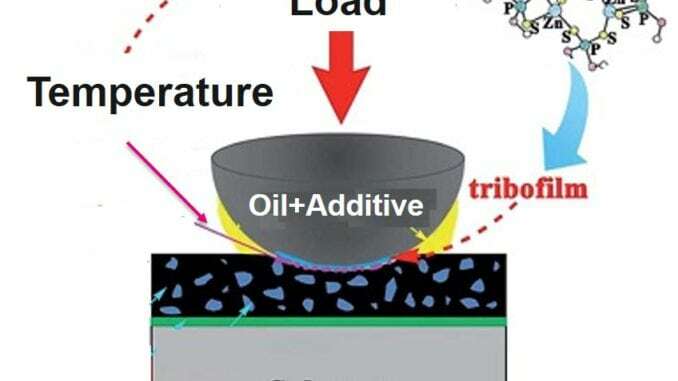 Boundary Lubricating Films: Formation and Lubrication Mechanism. 2005;38. Morina A, Neville, A. Tribofilms: Aspects of Formation, Stability and Removal. 2007;40. Garbar II. Gradation of Oxidational Wear of Metals. 2002;35. Barnes A, M., artle, K., D., Thibon, V.,R.,A. A Review of ZDDPS: Characterization and Role in the Lubricating Oil. 2001;34. Buyanovskii I, A. Boundary Lubrication by an Adsorption Layer. 2009;31.